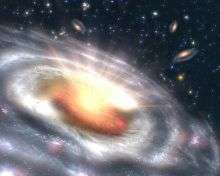 (PhysOrg.com) -- Using only the computing power of 16 Sony Playstation 3 gaming consoles, scientists at The University of Alabama in Huntsville and the University of Massachusetts, Dartmouth, have solved a mystery about the speed at which vibrating black holes stop vibrating. It may be the first time this kind of research has been conducted exclusively on a PS3 cluster: A related 2007 UMass Dartmouth/UAHuntsville project using a smaller PS3 cluster also used a "traditional" supercomputer to run its simulations. The biggest advantage of the console cluster — the PS3 Gravity Grid — at UMass Dartmouth was the cost saving, said Dr. Lior Burko, an assistant physics professor at UAHuntsville. "If we had rented computing time from a supercomputer center it would have cost us about $5,000 to run our simulation one time. For this project we ran our simulation several dozens of times to test different parameters and circumstances, so you can see how much that would have cost us. "You can build a cluster like this for perhaps $6,000, and then you can run the simulation as many times as you like at no additional cost." "Science budgets have been significantly dropping over the last decade," said UMass Dartmount Physics Professor Gaurav Khanna, who built the PS3 cluster. "Here's a way that people can do science projects less expensively." Khanna recently launched a website — www.ps3cluster.org — which includes step-by-step instructions for building a supercomputing PS3 cluster. The PS3 cluster was well suited to this type of astrophysical research, which requires a large number of mathematical calculations but has low demands for RAM memory, Burko said. "Not every kind of job would be suitable for that system, but it is exactly the kind of computation that we did." The current price for supercomputing time through a center like the National Science Foundation's TeraGrid or the Alabama Supercomputing Center is about $1 per CPU hour. Each PS3 has a powerful Cell processor. The 16-unit PS3 grid can complete a 5,000-CPU-hour (and $5,000) simulation run in about a day. That is a speed comparable to a rented supercomputer. Published in the journal, "Classical and Quantum Gravity," the new research resolved a dispute over the speed at which black holes stop vibrating after they first form or are perturbed by something like swallowing some matter. Khanna and Burko used a high resolution computer simulation to "perturb" a simulated spinning black hole, then watched as it returned to its quiet state. They found that the speed at which black holes go quiet was the faster of the two competing theories. Any excuse for buying an excesive number of gaming consuls is good enough for me. Sony, official sponsor of the technological singularity. I'll take a computer with a three-SLI slot motherboard. Put an Nvidia GeForce 280 graphics card in each slot. Do processing using Nvidia's CUDA technology. Now I have a single computer that uses the processing power of a total of 720 cores (not counting the CPU's cores). Cluster like machines. That enables some serious number crunching. And mom said video games weren't worth anything! Glad they're finding a valid use for the PS3 since its intended debut was, is, and will continue to be a gigaflop. Maybe their research can help Sony recognize when they've created a black hole before it starts sucking all of their money through the event horizon never to be seen again. So this point of mass that has no physical size in our universe vibrates? Which part? Why only 16 PS3's why not more? It cant be a price issue so what? I know it can be hard to understand for gamers, being a gamer myself- but I do not care what kind of rig you have with overclocking and cooling- there are things the ps3 can do in minutes that would take your computer days. Running a game with large amounts of complex shaders and real time post process lighting is a completely different thing then cracking an encryption code, or modeling out gravitational waves, or vectoring heat transfer through a material- or a million other things that just involve many small calculations that need to be done. The real problem for the PS3 is not the 512 megs of ram, it is the speed of its I/O system from hard drives, blue ray, and memory cards. That ram has been standardly running at 32000mhz since the first ps3 hit the shelves. If you had RAID that ram would be performing as well as various types of ram in amounts of 2-4GB, that beats GDDR5 and GDDR5 is not even out yet. The ram also has full bandwidth to the sub processors. The 8 cores also house robust amounts of registers- everything about that archetecture runs smooth. "Science budgets have been significantly dropping over the last decade,"
As the article indicates- less money means less money to go around to finance various projects. The Badaboom Media Converter software is a good alternative for lightening fast video conversion. It is made to be used in conjunction with a 200-series Nvidia Geforce graphics card such as the GeForce 260 or 280. Badaboom does the conversions using Nvidia's CUDA technology; hence all cores present in either graphics card are used for the converting. With so many cores in either graphics card, conversions are fast. Using more graphics cards on an SLI motherboard adds more cores and parallelism and further increases speed. Both graphics cards are available in various overclocked versions, too. I am speaking only of Nvidia's consumer graphics cards. More powerful Nvidia graphics cards are available for high-end work. Scrotus, you are a nincompoop. The universe is not 20 billion years old, and even if there was a singularity, there was no gravity at that time. Everyone knows that. Why would you take the time to type all of that nonsense. it has nothing to do with the article. Not only that, Mercury_01, but to add to his incredibility we should also mention that black holes aren't quite "theoretical". And it was never stated that nothing can escape it, just that nothing can escape it once it's gone beyond the event horizon. Big difference. There are regions before that point where it is still possible for particles to escape its pull. Where does the figure of $5,000 come from? NSF computing centers don't charge for usage, although maybe they should.